High Quality wooden croquet mallet with octagonal handle and brass rings around the hitting face. 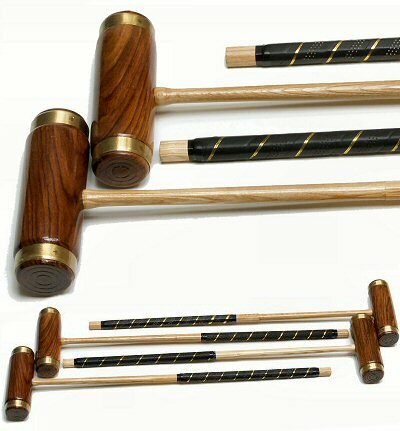 These FULL-SIZE mallets have solid ash handles. The grip end has a hand-crafted octagonal cross-sectioned shaft. These mallets have a perfect profile that creates a "sweet point", just above the hitting head, which is necessary for the satisfactory flexing of the shaft during the shot (notice how the shaft gets thinner after the grip and then thicker just before the hitting head). The hitting head is made from hardwood, which will last for many years of intense play, protected by brass rings. The advantage of hardwood is that it makes the mallet more durable and adds a bit more weight to the mallet, which helps to improve control when making a shot. Profiled shaft with "sweet spot"
Croquet mallets are arguably one of the most important parts of a croquet set (along with the balls). Get it right, and you will be able to really feel the shot, enabling you to gain more control and accuracy. Our George Wood mallet shown here offers a very good performance we are sure you will appreciate. Ideal for upgrading an existiong set.